From his dual perspective as former Clinton administration secretary of labor and academic social scientist, Reich (bestselling author of Locked in the Cabinet) offers a knowledgeable overview of the pros and cons of today's economy for the average worker. New ways of doing business spurred by digital technology, he states, have led to ""eye-popping deals and bargains, opportunities never dreamed of--exactly what you want, from anywhere, at the best price and value"" for consumers. At the same time, the ease with which potential buyers can switch to any better new deal puts all producers under intense competitive pressure. Reich argues that the choice between innovation or death that producers now face has filtered down to workers in the form of reduced loyalty from employers and sharply curtailed retirement and fringe benefits. Those who suspect that they are working harder over longer hours will find confirmation here that they are in good company, as well as a keen analysis of the impact of our new working arrangements on marriages, children and how we enjoy our lives. Then Reich pops the $1 million question: Would we willingly accede to the new demands of the workplace if we fully appreciated the consequences for our family lives? 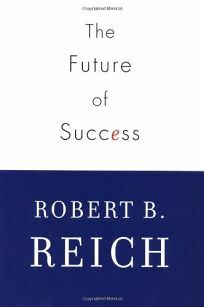 Sensing a growing dissatisfaction across the nation, Reich offers tantalizing proposals for moderating the more disruptive influences that have arrived along with the blessings of the emerging economy. (Jan. 15) Forecast: Reich's personal, engaging approach to the hot button topic of worker burnout in the new economy, combined with his high visibility in the traditional media, should raise the profile of this title, which has an announced 100,000-copy first printing, as well as a simultaneous audiobook release from Random.